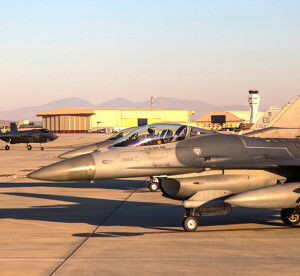 F-35s and F-16s taxi to the end of the runway at Edwards Air Force Base for for a multiple aircraft test event called Orange Flag. The test aircraft, outfitted with data-gathering gear, launched from Edwards Air Force Base, Naval Air Weapons Station China Lake, Calif., Naval Air Station Point Mugu, Calif., and Nellis AFB, Nev. Orange Flag tests the interoperability of the Air Force, Navy and Marine fighters, bombers, and Command-and-Control aircraft. Twenty-eight aircraft gathered in the skies above the Mojave Desert during the three-hour test event named after the symbolic color of flight test–orange. The test aircraft, outfitted with data-gathering gear, launched from Edwards Air Force Base, Naval Air Weapons Station China Lake, Naval Air Station Point Mugu, Calif., and Nellis AFB, Nev. 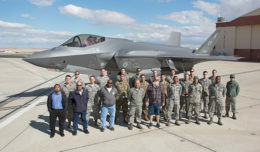 According to Lt. Col. Richard Turner, F-35 pilot and 412 Operations Group deputy commander, Orange Flag tests the interoperability of the services’ fighters, bombers, and Command-and-Control aircraft. Cooperation between Developmental Test and Operational Test, or combined DT-OT, have proven successful in the past for both the Air Force and Navy but were primarily focused on testing a single aircraft type such as the F-18 or F-22. Orange Flag represents a collaborative effort not only between DT and OT, but across the Air Force, Navy and Marines. “The ‘developmental’ objectives were developed by the 412th Test Wing here, the 96th Test Wing at Eglin AFB, Florida, and the Navy’s VX-31 Test Squadron at NAWS China Lake. 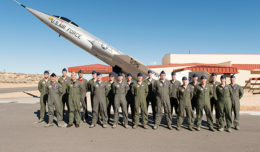 The ‘operational’ objectives came from the 53rd Test Wing at Nellis, and the Joint Strike Fighter (JSF) Operational Test Team at Edwards,” said Turner. Personnel tested eight different types of aircraft: F-35As and F-35Bs (Air Force and Marine variants), F-18E Super Hornets, F-18G Growlers, E-2C Hawkeyes, F-22 Raptors, F-15C Eagles, F-15E Strike Eagles and F-16 Fighting Falcons. Additionally, a ground station participated in support of B-1 developmental testing. Merging all of these objectives took the efforts of test pilots, engineers, and airspace operators. Turner led the innovative approach to testing the highly complex system(s). Test engineer Kristofer Peterson noted that the value of the unique data set generated during the test brings to light issues that may have previously been unknown, which could potentially bring about innovation after the data is evaluated and leveraged. A key component for any exercise or test maneuver the Air Force does is the air space. Lieutenant Col. Chris Buckley, 412th Operations Support Squadron Commander, oversees the restricted airspace which hosted the event. 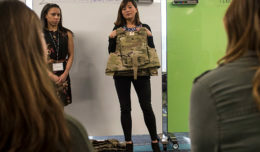 Orange Flag, its design and implementation, is the product of an overall “core strategy” developed by the 412th’s Operations Group that seeks to optimize the use of test resources in support of Global Power, Reach, and Vigilance, according to Chris Klug, 412th OG technical adviser. “Our core strategy is resource optimization, and Orange Flag represents one of the best uses of our resources that I have seen in my time as a tester, said Klug. The planning included 10 organizations distributed across five different locations. 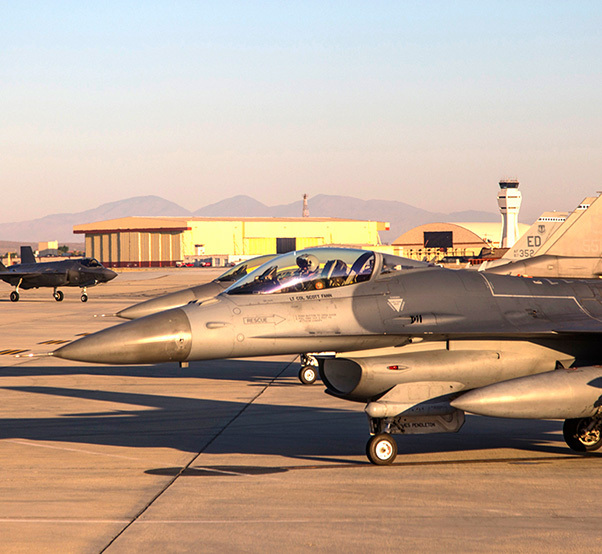 This year’s Orange Flag served as an example of successful distributed test operations, with control rooms at Edwards and China Lake ensuring effective test setup and execution of operations originating from Edwards, China Lake, Nellis, Eglin Air Force Base, Fla., and Pt. Mugu. Future Orange Flag events are scheduled to occur each quarter starting in February 2018.